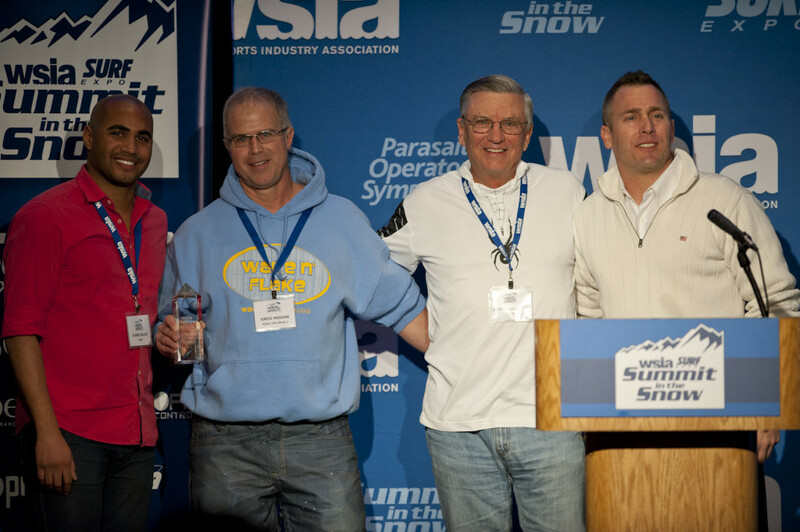 The 2015 Summit in the Snow concluded on a high note with the annual industry awards presentation, the WSIA Leadership Awards for 2014. 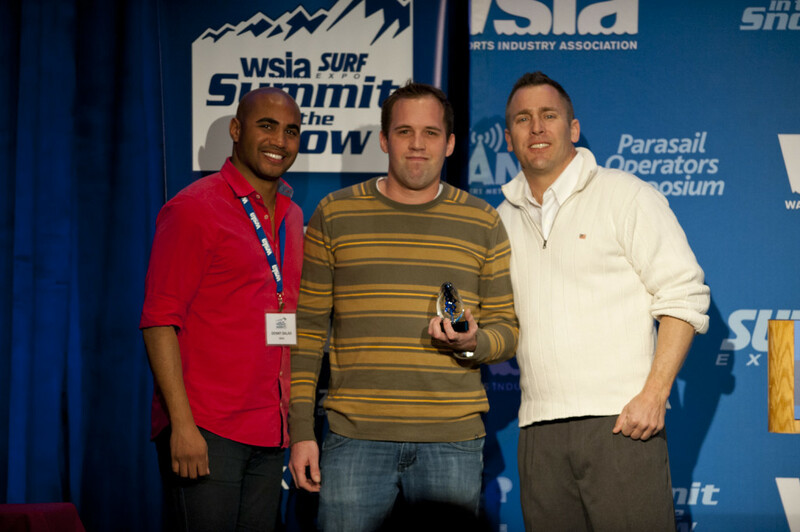 For years, held in conjunction with Wake Awards during the fall Surf Expo, this year saw the ceremony uniquely enjoyed by the WSIA membership, all of whom participated in the newly established voting procedure employed for each of the six award categories. 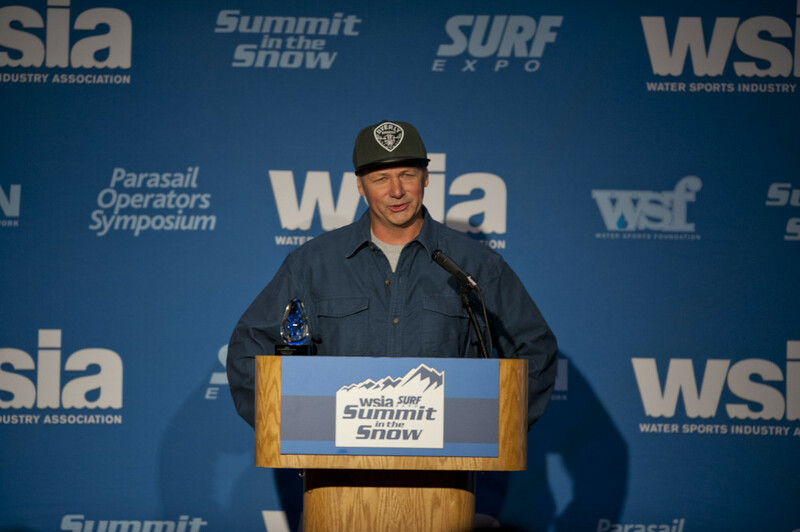 In all, it was an outstanding celebration of the best people, products and companies prospering in the water sports market. This year’s Leadership Awards saw the inclusion of several new categories, one of which paid honor to a longtime board member, former Executive Director and current board chairman, Larry Meddock. The “Larry Meddock Award” was the final trophy given out this year, but the awards were opened with remarks about Larry made by a longtime friend and fellow board member, Jeff Bannister, president of Connelly/CWB. 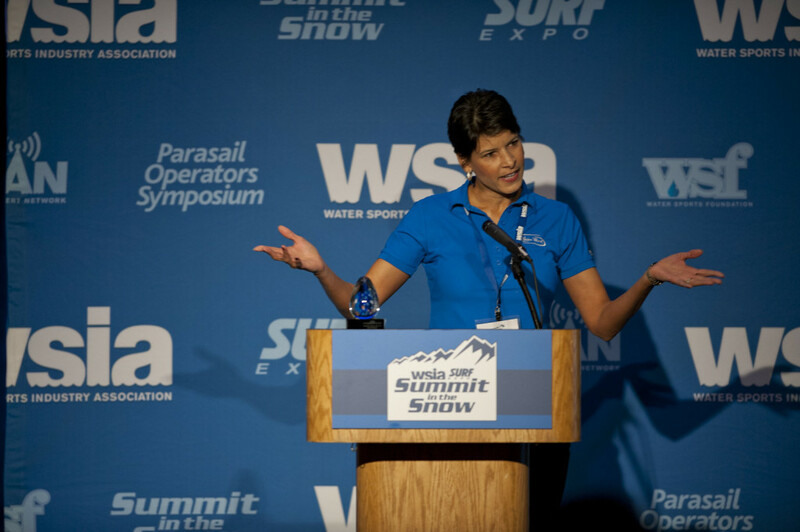 Bannister offered great insight to the value of Larry’s participation in the water sports industry, offering anecdotal stories about the various projects and successes Larry has provided to the WSIA. And Bannister concluded very succinctly by saying, “Larry loves our industry more than anyone I know.” – a sentiment shared throughout the ranks of the WSIA membership. The ceremony opened with another new category for “Sales Rep of the Year.” Meant to recognize those industry members out on the front lines, this award recognized the industry’s best at connecting and educating at the retail and customer level. Subtitled, “The 110 Percent Award,” those nominated made a strong impression industry-wide. The category recognized the tireless efforts and dedication to representing their product lines while also growing the industry through promoting and attending grassroots and professional events. For 2014, no one did it better than Eddie Beverly. With more than 25 years of service to HO/Hyperlite/Byerly, Eddie is renown throughout the southeast for his endless time on the road representing his brand whenever and whenever possible. He likened his role to that of a rock star, minus the glamorous elements. “Like a rock star, I put in thousands of miles on the road, I sleep in hotels all the time and I eat most of my meals off the dashboard of my truck.” He also offered insight to a maxim shared with him, one that he kept as a pillar of his approach as a rep. “A wise man once told me, ‘Even if you can’t make a sale, make a friend.’” Beverly has certainly done that and more throughout his 29-year tenure in the water sports industry. Consideration for this group focused on the diversity of training offered, knowledge and quality teaching offered by the instructors, number of campers hosted, lodging and amenities with support and promotion of events and competitions. This year it was the Bennett Waterski and Wakeboard School taking the honors. In 2014, Bennett’s hosted over 500 towed water sport athletes from all corners of the globe, due in great part to the enviable reputation they’ve built as a leader in the instruction business for over 35 years. Bennett’s was represented at the Leadership Awards this year by Matt Belter, who pointed out “Jake was unable to make him himself available to the awards because Bennett’s was booked solid all week.” – certainly a reasonable explanation all could understand. Truly the heart and soul of this industry, dealerships are the consumer point of connection representing the greatest financial commitment a customer will ever make, simply to participate in boating and on-water activities. Finalists in this division have a strong variety of inventory on display in their own facilities and at regional boat shows. They have a strong community outreach through events, contests and promotions with knowledgeable sales staff on hand and a quality service department. In 2014, none did this better than Charlotte Ski Boats. Their sales were phenomenal, moving 64 new and 29 used boats, they promoted and hosted weekly customer driven events and punctuated their season with the “Wylie Wicked Fest,” a double up competition that is attended by amateur and pro riders alike. They also raised in excess of $150,000 for various industry related charities and philanthropies. 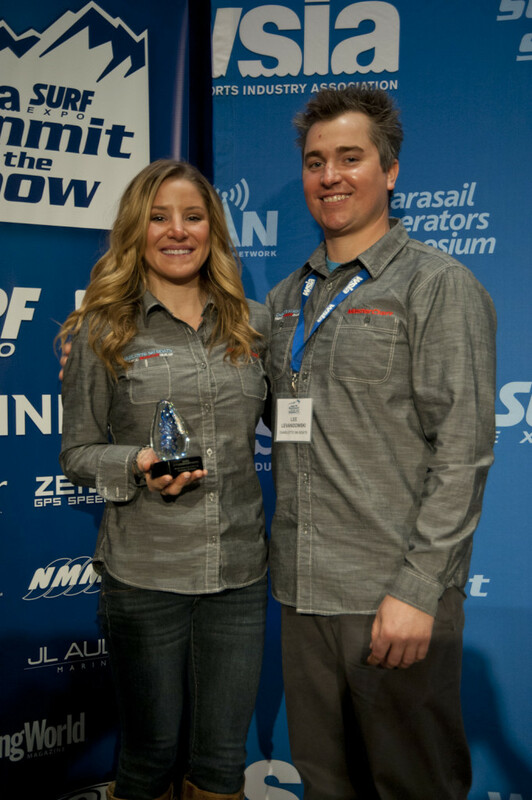 Any industry needs progression to inspire growth, and the “Innovative Product of the Year” award was designed to recognize the water sport industry members pushing our industry into the future. Consideration was given to product and design innovations that are both functional and unique while providing benefit to the sport and consumer alike. For 2014, that progression was paced by Wake-WorX and their Mussel Mast’r product. This ingenious device addresses the needs of ballast tank decontamination against a rising epidemic of aquatic invasive species that have stricken waterways across the United States. Their filtration system both stops the spread of make-to-lake contamination while saving time during the trailing and cleaning process at the beginning and end of a day on the water. Mary Kate Woods spoke on behalf of herself and her husband Scott regarding the two-year engineering and researching process that spanned nearly two dozen states. 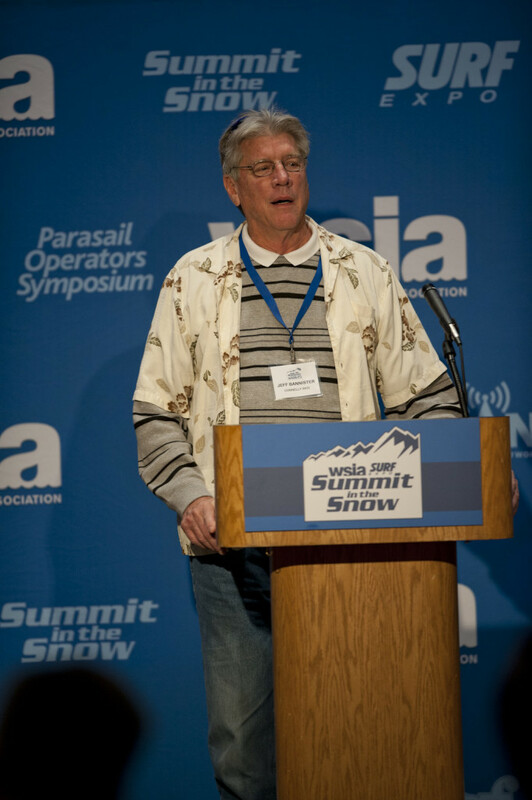 “Larry brought this to the attention of the WSIA years ago and challenged the industry to find a solution to this growing problem. My husband immediately said, “This is easy. Just don’t let them (the contaminants) in (to the ballast compartments).” So began the undertaking to make an effective and efficient filtration system that kept out those live aquatic species from taking up home. 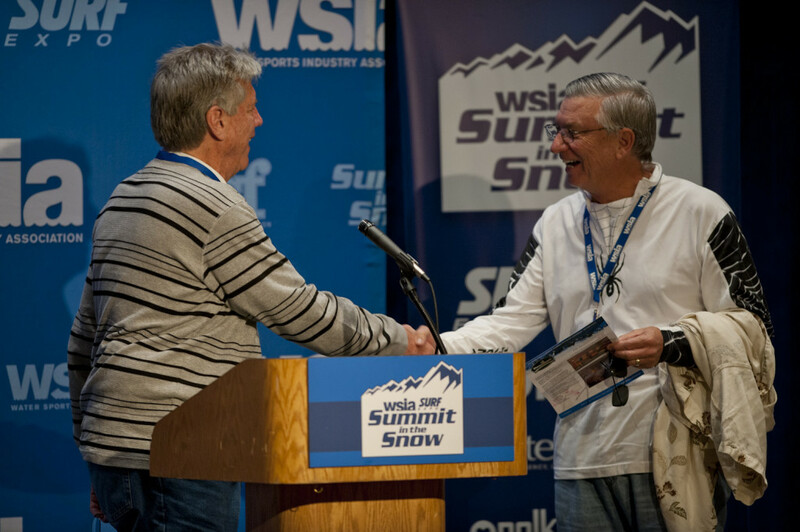 A new category for this year, the “Larry Meddock Award” was earned by the person or group who best served the general purpose of the water sports marketplace and did so with no personal benefit or gain. Three worthy finalists were under consideration and it was Greg Hodgin from Wake The World who addressed the crowd as the first-ever recipient of this coveted award. “I have been water skiing since I was 13. 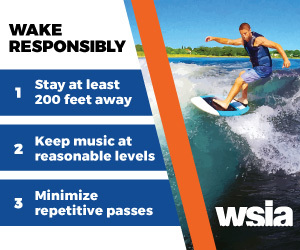 I’ve read every WATERSKI and WAKEBOARDING Magazine from front to back. I’m just simply a fan of these sports. And to be honored by the industry for something I love means the world to me.” Greg has shared that love with underprivileged kids, economically challenged families, Wounded Warriors and more throughout 2014, treating their guests to a full-day experience out on the water, showing them how wonderful and bonding towed water sports can be.